On the weekends, sometimes I splurge and have something other than wine as an alcoholic beverage. Rarely do I drink vodka however. I know that sounds strange as it is the most popular spirit but I’ve just never been that taken with vodka. 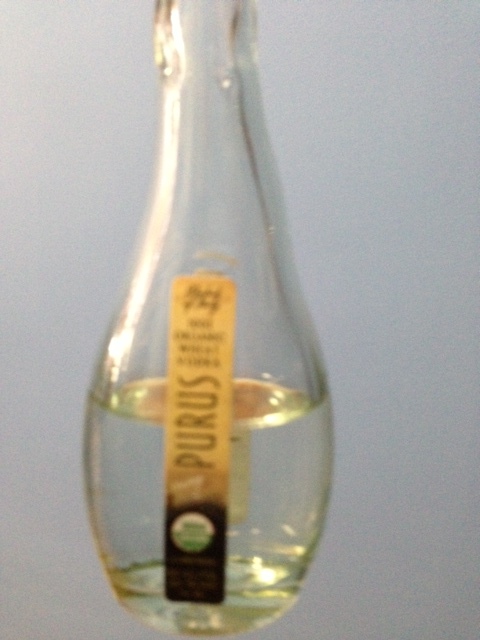 Last year, I had the occasion to try a vodka which did interest me, Purus, made from organic wheat and coming from Piedmont in Italy. Of course, the Italian part excited me and I was pleased to see that the vodka was interesting and elegant. I have to say it was my first press lunch drinking vodka with the meal and it was very enjoyable. The vodka is column distilled five times and filtered. The vodka itself was smooth, clean, and mellow on the palate with a hint of citrus and a long, layered finish. I just finished reading an interesting book set in Russia called Snowdrops. Throughout the book, the characters are constantly drinking vodka, naturally, I too wanted to partake in this spirit and luckily for me, I had a small bottle of Purus left to taste again. Looking back on my notes from the lunch, I found the flavors to be very consistent and the tasting profile to be exactly what I had in my notes. This would be characterized as a Western style vodka according to my WSET book, meaning creamier and smoother than some of the Eastern style vodkas which are a bit harsher. It would be a great vodka for cocktails. Tasting it this afternoon for the third time, I have to say I would highly recommend it to all.